Definitely and it feels pretty good! Got a new t-shirt design on our website. 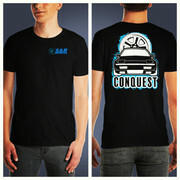 You can go to www.sandrmotoring.com to pick one up! I will be making a starion shirt too. Edited by jellyneck, 08 September 2018 - 06:44 AM. Got a new t-shirt design on our website. You can go to www.sandrmotoring.com to pick one up! Awesome! Thanks bro! I will get it out to you asap. Haha that's awesome, I will tell Randall! Thank you for subscribing! She's been a quadriplegic since a 1974 diving accident. Thus, ' Project Marla' is very fitting!! How long until Starion shirts are up for sale? Edited by Bradrock, 08 September 2018 - 02:37 PM. They will go up for sale on Monday. The file is on my computer at work, so I have to wait until then to edit it. New build video on my YouTube channel, please check it out and subscribe! Thanks! Just posted another build video, check it out! Nice video. Should probably put on indicator on the front nose of that crank and check end clearance.Should be .002-.007 just to make sure.It would be a good demonstration also. (crank needs to float) very important. Edited by croquest87, 13 November 2018 - 06:54 AM. Definitely going to do that. I printed out Randy's engine build FAQ. It will be in the next video! New build video is on the channel. Starion shirts are now available on our website. It wants us to sign up to buy a shirt. Any discounts for multiple shirts? Right now we are doing free shipping. You can use coupon code FREESHIP at checkout. It's only good for 24 hours. Edited by jellyneck, 15 December 2018 - 01:41 PM. I ordered one back in September. But I thought there were other colors. Do you have red or blue available?